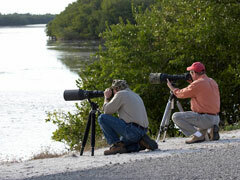 If you are serious about bird watching, you'll most likely want to buy a bird watching scope. While bird watching scopes are expensive — they start at about $400 and can cost more than $2,000 for a top-of-the-line model — they can definitely enhance your bird watching experience. You won't be able to use your scope in every bird watching situation, but you will be able to use it in most. 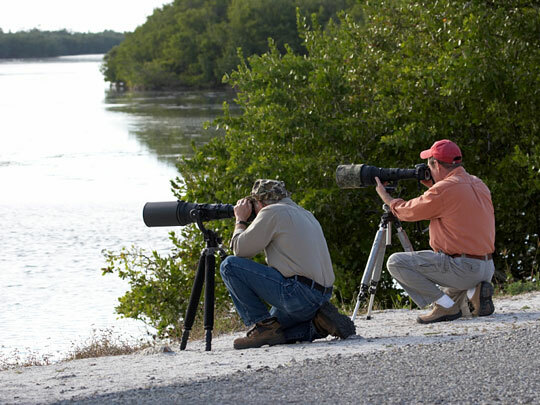 As a general rule of thumb, scopes are best for scanning broad areas, as well as for viewing distant birds like shorebirds, waterfowl, and perched birds of prey. That being said, scopes can also be used for looking at birds that are closer, as long as the birds are cooperative. Train your scope on a bird just 50 feet away, and you'll most likely be able to see its breathtaking markings or beads of water on its feathers. The aperture on a scope is the diameter of the lens, and scopes with larger apertures are more expensive. However, since the resolution is far better than with smaller apertures, you might put aperture on your priority list. Erecting prisms show the bird through the lens the right way. Scopes without erecting prisms — specifically high-powered models — will give you a backward image. Many birders won't even consider buying a scope without an erecting prism. When choosing a scope, the eyepiece might be the most important part, since it is what gives the scope its magnifying power. On most spotting scopes, you can change the eyepiece depending upon your situation. Find out whether the scope comes with the eyepiece, and what the power of the eyepiece is. You may want to consider buying additional eyepieces if you find yourself in different viewing situations. Finally, you will need a good-quality tripod that works with your spotting scope, in order to keep the scope steady while you watch the birds. The birding optics articles on the Bird Watcher's Digest website feature practical advice for spotting scope and binocular users and buyers, including tips on how to select the right scope and get the most from your scope. Topics include scope set up, finding birds, and foreshortening as well as interchangeable lenses and eye protection.